1. 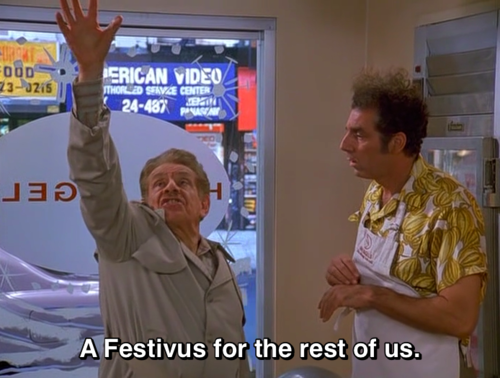 )?We told you about how the origins of Festivus began in Westchester, but now you can celebrate with the King of Festivus?himself, Jerry Stiller who played Frank Costanza on Seinfeld. He and his daughter, Amy Stiller, will join The Freethinkers of Hastings-on-Hudson for a Festivus celebration tonight at 6 p.m. in front the Festivus pole at the village’s VFW Park on Warburton Avenue. There will be music, some sweet treats, airing of grievances and mini Festivus poles for those who attend to take home. There is no word yet on whether those in attendance will partake in feats of strength. The Freethinkers will then take their merrymaking on down to The Mill for the restaurant/bar’s first official Festivus celebration. 2.) It’s important to set goals for yourself, however, the truth is that only about 8% of New Year’s resolutions stick. Instead of focusing on the things that you didn’t achieve in the prior year or might not achieve in the next, Psychology Today suggests making a list of all the awesome things you’ve done this year. Whenever you’re feeling less confident, whip it out and take a look at all your accomplishments. ?Once you’re all pumped up by how amazing you are, then you can start your list of fears. By confronting those fears, you can discover solutions to rid yourself of that fear and thus the road blocks that prevent you from being successful. Read the full story in Psychology Today here. If you desire to take a great deal from this post then you have to apply these methods to your won website. regular basis, if so afterward you will absolutely take fastidious experience.